Recently a very special man I know celebrated his 97th birthday. In recent years I noticed that as each birthday arrived he became more and more proud of his age! That started me to thinking about making him a card with his age on it just like you see on cards for kids. When I came across these vintage metal numerals at a flea market I thought they were exactly what I needed for his card. 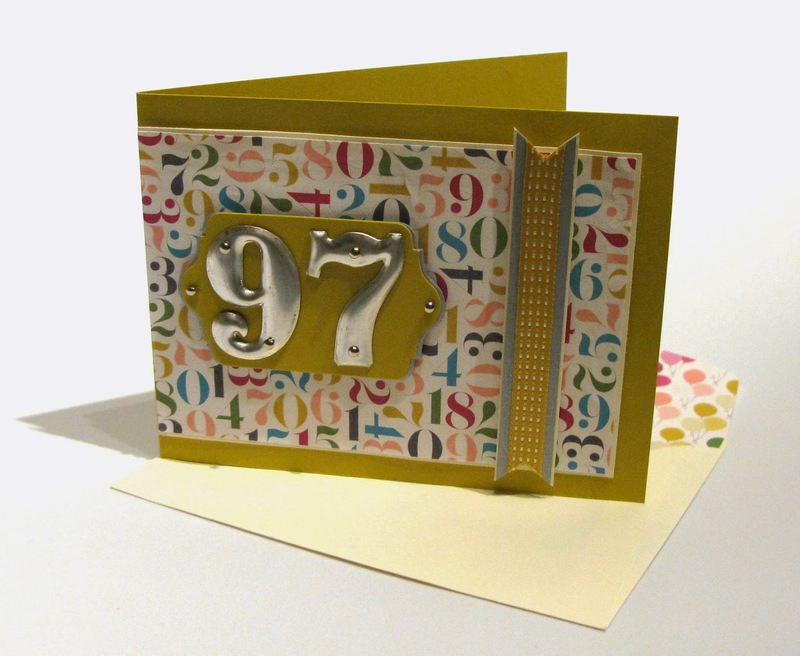 Next I looked for Designer Series Paper to use with the numerals and this Birthday Basics DSP with all the numerals all over it seemed perfect! The great thing about using DSP on a card is that your color combinations are already pulled together for you. It makes it all so easy! While this collection of DSP is great for birthdays for all ages, at least one side of each piece can be used for any occasion, making it completely versatile. I then created a mat for the numerals using one of the Chalk Talk Framelits and then cut a second piece out of Brushed Silver cardstock to use as an outline on each end of the mat. I bought my numerals last summer before the Holiday catalog came out but the Morning Post Numbers clear mount stamp set (131841) in the current Holiday Catalog would also work great on this card or on a similar card for kids or adults alike! Please email me any questions or ask them in a comment below! Katie - I love this card! The layout is really great, and the choice of Summer Starfruit as the accent color is wonderful! Happiest Birthday to your friend!